The diminshing habitat of woodland wildflowers leaves them in a delicate balance for future survival. Not only is man’s destruction of their habitat a factor, invasive weeds also play a large role in “squeezing out ” wildflowers from their environment. They rob the plants of sunlight, water and nutrients. It is important that we become stewarts of preserving the wildflowers we still have and hopefully, will have in the future. Descritpion: This woodland wildfower grows 4 to 9 inches high. Soft green stem. Compound leaves with 3 rounded, notched leaflets arranged in elevated whorls around single, central flowering stalks. Basal leaves also look more notched than lobed. 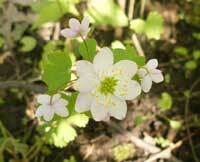 This species is similar to the False Rue Anemone (Isopyrum biternatum), but differs by having 3 whorled leaves just below the flower. Collect seeds: June. Cluster of small, green seeds (achenes) at end of branched stalks come off easily when rubbed between fingers. The fruit of A. thalictroides can be distinguished from that of Isopyrum biternatum which bears a small follicle (pod containing several seeds) rather than an achene. Because A. thalictroides flowers over a period of time, both ripe and unripe seeds are likely to be found at the same time. Seed can be picked over several weeks. Descrition: A woodland wildflower which grows 4 to 12 inches high. 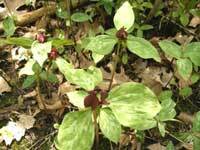 One large, maroon stalkless flower above a whorl of 3 whorled leaves, that appears closed. Collect seeds: Early July. One dry berry, angled, up to 1 inch in diameter forms at the end of a stalk in the middle of 3 green sepals. The berry rolls off plant easily when pinched or pushed. Seeds inside are reddish brown and are surrounded by a sticky caruncle. Do not allow to dry out while storing. 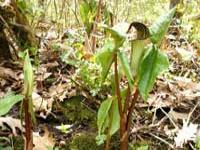 Habitat: Rich moist woodland, wet swamps, or drier areas in high open woods where soil is rich in humus. Description: 15 – 30 inches high. Perennial. Leaflike hood (spathe) surrounds a central column (spadix). Spathe is green or purplish brown, often striped. Leaves, 1 or 2, long-stalked, 3 parted. This woodland wildflower is dioecious. Females bear fruit. Collect seeds: Seed timing: Mid-August through September. Shortly after spathe withers a dense cluster of green berries appears. Cluster slowly expands, turns orange, then scarlet red. Often leaves deteriorate before fruit matures so that seed collectors see only a single green stalk supporting the cluster of brilliant red berries which can then be picked. Seed cleaning should be started within a few days of collection while pulp is still soft. Information on each wildflower includes details on when to pick the seeds. This is intended to guide seed harvesting efforts for restoration, but can also be used in your own yard. Remember to never pick seeds from the wild without permission from the landowner. We have not had much luck with commercial wildflower seeds. We planted a strip and kept it watered, but nothing came up. Are these packets a rip off? Any suggestions? Should the native wildflowers be raised in nurseries? Can they come directly from natural areas? It is important that the wildflowers and seeds themselves do not come directly from the natural areas. Poaching of native plants and seeds from wild areas will eventually deplete these areas of the seed stock they need to be self sustaining. Responsible nurseries and garden centers raise the native plants themselves, or otherwise ensure that the plants that they sell were not stolen from the wild. Often nurseries will receive seed stock from the stewards of natural areas.